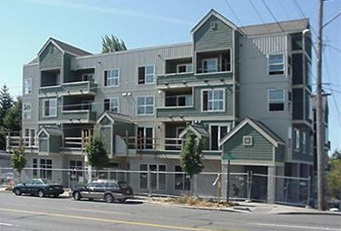 Jade Mountain is a small condominium building in Seattle’s Greenwood neighborhood and features 26 units ranging from 638 to 871 sq ft. Standard features include tiled entry, granite tiled countertops, appliances and parking. Located at 9057 Greenwood Avenue, it’s walking distance to Greenwood’s commercial district – antique stores, retail and numerous eateries including Gorditos. Greenwood Avenue is a north/south thoroughfare, though this portion is not heavily used by commuters. Most people communting to downtown use Aurora or 15th Avenue. Do you know if there are any available units in this building still? I’d love to take a look! Is the 2-BR unit still available and, if so, by chance does it have a patio? Julie, it is available and it does have a small deck. I’ve sent you the listing info. Is the 2-br unit still available – if so I would like to view it. Can you send me the listing and photos please? Peter – I sent the info. Is Jade Mountain new construction, or is it a conversion? Anita – Jade Mountain was built as new condominiums. Do you know if there are any 2-bedroom condos still for sale? Thanks! There is a two-bedroom available as well as a one-bedroom. Click to view info. Amir – the only common areas are the garage and courtyard (open area in the center of the complex).